Not much of a "recipe" since you just have to put tea bags in a bottle of vodka, but I thought some of you might appreciate trying this one. 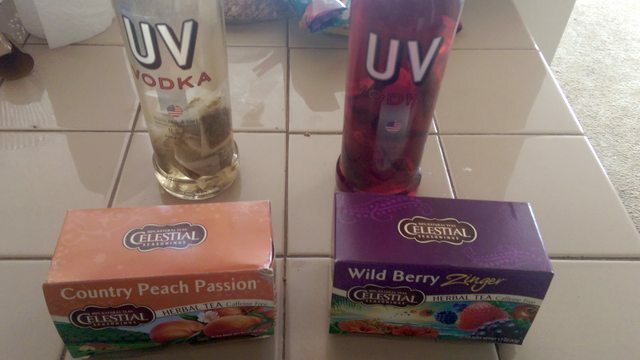 Using fruit herbal teas gives the vodka a nice fruit flavor without adding a bunch of sugar like the store bought flavored vodkas. The celestial seasoning flavors seems to work the best, others I've tried like those Lipton pyramid ones didn't have the same kick. My personal favorite is Country Passion Peach, but Wild Berry Zinger is also pretty popular with my friends. But I haven't tried too many other brands, so I'd be interested to hear back any other flavors that turned out well. Just put 5 bags in a 750mL and let it soak for at least 2-3 hours until it develops a nice color like the bottle shown on the right. Goes great mixed with club soda for sugar free option, or sprite/mountain dew if you want sweetness.